Cambridge United chairman Paul Barry has reiterated that no decision will be taken over their vacant managerial post until after the end of the season. 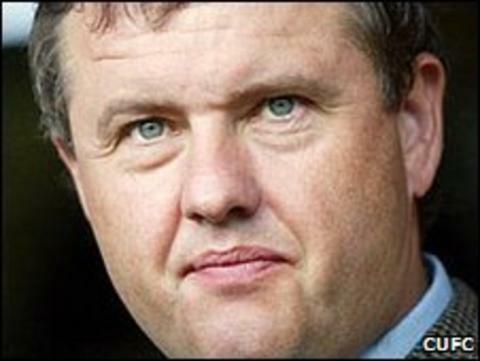 Director of football Jez George was appointed as caretaker boss in February following the dismissal of Martin Ling. Barry told BBC Radio Cambridgeshire: "We'll review the situation as soon as this season is at an end. "Jez will of course be part of those discussions, but we're not leaning in any direction at this moment in time." The U's confirmed their survival in the Blue Square Bet Premier for another season with Monday's 0-0 draw at York. George, whose regular job sees him oversee the U's academy, has picked up three wins, seven draws and five defeats from his 15 games at the helm. With the experienced pair of Paul Carden and Daryl Clare leaving the Abbey on loan, a number of young prospects have come into the team including Luke Berry, Liam Hughes and Jordan Patrick. "In some of the games this season we've had five or six of our academy graduates on the field at the same time," Barry said. "That is very positive for the club and in the years to come we can become a true Cambridge football club once again." George has previously claimed to have no interest in remaining as manager on a permanent basis. Former Gillingham boss Mark Stimpson, Rushden manager Justin Edinburgh, and U's legends Steve Fallon, Andy Sinton and Liam Daisch have all been mentioned in connection with the post.